Chinese giant Xiaomi announced early this month plans to enter the European market with many of its products, including smartphones. The company confirmed its smartphones will be available in 3 Group's stores in Austria, Denmark, Ireland, Italy, Sweden and the UK. In addition, thanks to the partnership with A.S. Watson's Fortress, Superdrug and Kruidvat stores, many of its products will be officially available for purchase in Ireland, the Netherlands, and the UK. Today, Xiaomi announced that it will expand to two more European countries by the end of the month: France and Italy. In fact, the handset maker is bold enough to offer exact dates for when its smartphones will be officially introduced in these countries. 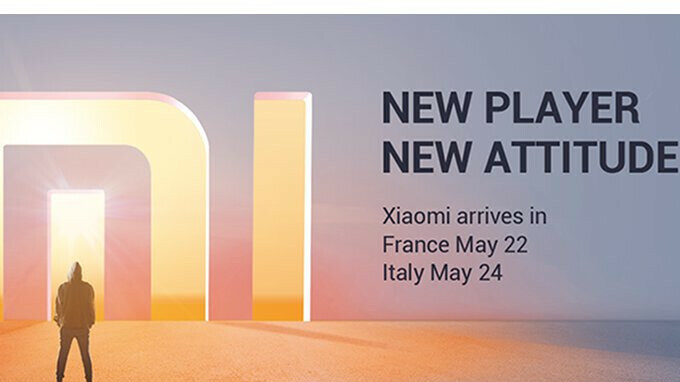 Apparently, Xiaomi will arrive in France on May 22 and in Italy on May 24. Xiaomi entered the European market for the first time back in November when its smartphones were officially introduced in Spain. Hopefully, by the end of the year, the company's handsets will go on sale in the United States as well. Xiaomi just kill the competition over there in European countries on all Samsung,apple midrange phones market share and sales.These Europeans will get a better taste,idea of what an all rounder midrange specs are all about.People over deserve some good midrange smartphones from a trusted,loyal company not under specs phones from any scum company who don't care about customers needs and wants,really glad xiaomi is expanding to other global markets hope they achieve huge success every year with good midrange specs price friendly smartphones and flagship phones. Xiaomi is actually a real competition because it's makes it's mark in every place they go and competion in the market got 4x increased in just one day. When it comes to India no one wanted a Chinese branded phones because of inferior quality and bad goodwill for less durability. And that's why there is no competition in budget and midrange segment there's no good budget or midrange phones in the market that time. But Xiaomi gives really good quality and strong build phones with decent specs at really low price. And changed everyone's mindset for Chinese phones companies.